MacGregor, part of Cargotec, has secured a contract with the Brazilian shipowner and shipbuilder Grupo CBO. The contract is to supply Triplex deck handling equipment and cranes for four customised Havyard 843 anchor handling tug supply vessels (AHTS). The order was booked into first quarter 2015 order intake. The 81.5m Havyard 843 is a modern anchor-handling vessel with a maximum speed of 16 knots. It has a 400 tonne anchor handling winch and accommodation for up to 30. 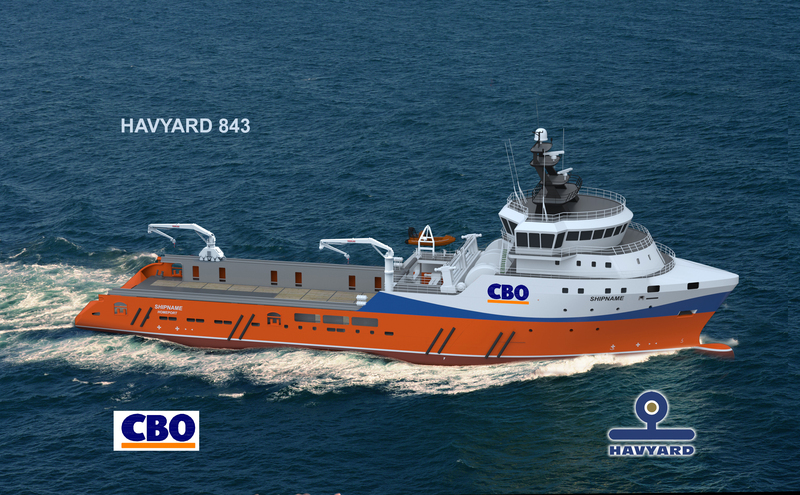 This Havyard design will be adapted to meet the particular requirements of Brazilian energy company, Petrobras. Two vessels will be built at Grupo CBO's Estaleiro Aliança yard and two at the Estaleiro Oceana yard. Under the contract with CBO, MacGregor will provide each vessel with two sets of Triplex shark jaws (H-700) and guide pins (S-200), one cargo rail crane (KNC-60) and one knuckle boom deck crane (KN-150). "We are delighted to sign another contract with CBO, further growing our good relationship," says Even Arne Kippernes, sales manager for Triplex products at MacGregor. "The Triplex shark jaws and guide pins are market leading products. They will help to ensure safe working deck operations on the new vessels; the jaws have a unique quick release system and, when not in use, they lie flush with the deck. The combination of Triplex cranes will provide very flexible, safe and reliable lifting capabilities."